In addition to facing possible time in jail or prison, District Court and Circuit Court Judges in the state of Maryland can place you on a period of probation from One (1) day to Five (5) years. Probation may require you to check-in with a Maryland Parole and Probation agent once daily, weekly, and monthly or on a bi-monthly basis. 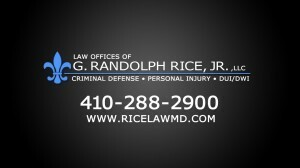 If you are charged or have been arrested for the crime of Drug Crimes in the state of Maryland, your freedom until trial is an important aspect of your case. Being able to work, spend time with family, and assist in the defense pending trial is invaluable. We provide 24/7 response to clients seeking legal assistance and advice for Bail Reviews, Bail Hearings, and Petitions for Habeas Corpus hearings.